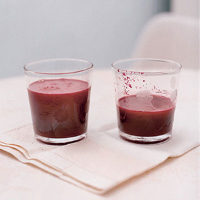 This fresh juice is an antioxidant-rich energy provider. It's a great kick-start in the morning and even better if you've had one too many glasses of wine the night before. Place 2 glasses in the freezer to chill. Cut the fruit and vegetables into small chunks and push through the feeder of a juicer. Pour the juice into the chilled glasses and drink immediately.